Regardless of how long Caley Thistle keep their impressive unbeaten league run going, match number 18 against Queen of the South will not live long in the memory. Inverness managed to keep the Doonhamers and their much-lauded 21-goal attacker Stephen Dobbie at bay but there was a paucity of chances that fell their own way on a frustrating afternoon for John Robertson’s men. Blustery conditions conspired to make this a difficult encounter with the creativity of some of the game’s flair players largely thwarted in a game which was mainly contested in the middle of the park. This result is no cause for alarm, coming against a Queens side that defeated league leaders Ayr United 5-0 just weeks ago but on this occasion the Dumfries outfit set up to be well organised in their defensive make-up to limit opportunities for Inverness. 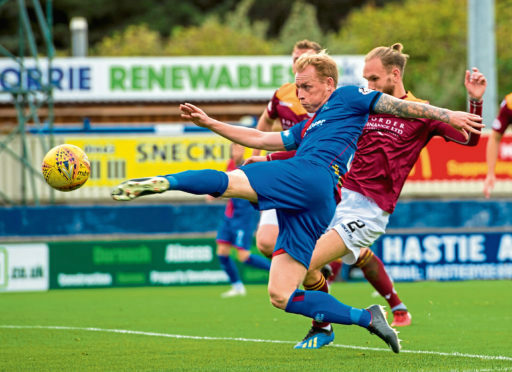 The game was the first of back-to-back home matches for Caley Jags with John Robertson seeing the games against Queens and Morton as an opportunity to consolidate their position at the top end of the table. The previous weekend’s Highland derby was an encouraging display, against one of the Championship title favourites and, despite the lack of a breakthrough against Ross County, it was a relatively straight-forward decision to keep faith with the same starting 11 for a fourth successive match. Queens began on the front foot with veteran danger men Dobbie and Gary Harkins showing some neat touches. The first attempt fell to Lyndon Dykes with the midfielder seeing his long-range effort held by Mark Ridgers. Despite the Doonhamers looking dangerous, Caley Jags gradually began to gather pace. Aaron Doran provided their first attempt on 17 minutes with his 25-yard effort saved by Alan Martin before the two full-backs nearly combined to great effect moments later when Shaun Rooney’s delivery was sliced wide by Carl Tremarco. A bizarre episode of play could have led to an opener for the Highlanders on 22 minutes. Martin’s throw clipped the back of Scott Mercer’s heels before falling kindly into the path of Doran who slipped in Tom Walsh but the winger’s strike was blocked by Jordan Marshall. Inverness dominated the remainder of the first half but had little to show for it. Queens were quick out of the blocks after the interval with Callum Semple nodding Dobbie’s corner over the bar before Dobbie dragged an effort wide. Inverness were resorting to the speculative in their attempts to break the deadlock, although Sean Welsh was not far away with a 25-yard strike. It was Queens who came closest to the breakthrough just after the hour with the otherwise quiet Dobbie clipping the top of the crossbar with a free kick. The introduction of Riccardo Calder and Daniel MacKay could not provide the spark Caley Jags required, with their only late threat coming when Rooney’s menacing low delivery was cut out by defender Callum Semple.